For America, WWII began of December 7, 1941, with the attack on Pearl Harbor, the first of Japan's day-long assault on locations throughout the Pacific. Major American installations on Luzon, the largest island of the Philippines, were also devastated; so began America's first great battle of WWII. The Japanese began their amphibious invasion of Luzon two weeks after the attack. By January 1942, American and Filipino Armies were pushed south towards the Bataan Peninsula. Wracked with starvation, debilitating tropical disease and facing dwindling supplies of ammunition and equipment they still continued to fight for three more months, supported by courageous Filipino civilians. The defense by American and Filipino Armies delayed the Japanese timetable for conquest of the Pacific by many months, allowing America to rearm for war. 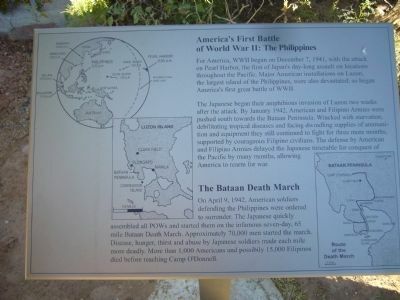 America's First Battle of World War II: The Philippines Marker is just out of sight to the right in photo. and abuse by Japanese soldiers made each mile more deadly. More than 1,000 Americans and possibly 15,000 Filipinos died before reaching Camp O'Donnell. Location. 32° 20.067′ N, 106° 44.983′ W. Marker is in Las Cruces, New Mexico, in Dona Ana County. Marker can be reached from North Roadrunner Parkway 1.8 miles south of U.S. 70. Touch for map. Marker is in the southeast corner of Veteran's Park. Marker is in this post office area: Las Cruces NM 88011, United States of America. Touch for directions. Other nearby markers. At least 8 other markers are within 5 miles of this marker, measured as the crow flies. 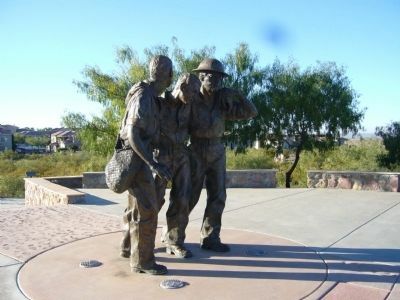 Heroes of Bataan (here, next to this marker); Rio Grande Theatre (approx. 2.4 miles away); Doña Ana County Courthouse (approx. 2.6 miles away); The Historic Green Bridge (approx. 3 miles away); Pat Garrett Murder Site (approx. 3.3 miles away); Miller Field Gates (approx. 3.6 miles away); María Gutiérrez Spencer (approx. 3.7 miles away); La Mesilla (approx. 4.8 miles away). Touch for a list and map of all markers in Las Cruces. More. Search the internet for America's First Battle of World War II: The Philippines. Credits. This page was last revised on June 16, 2016. This page originally submitted on November 22, 2010, by Bill Kirchner of Tucson, Arizona. This page has been viewed 1,714 times since then and 31 times this year. Photos: 1, 2. submitted on November 22, 2010, by Bill Kirchner of Tucson, Arizona. • Craig Swain was the editor who published this page.